Kate and Geoff Mercer are about to celebrate their 45th wedding anniversary. The venue has been booked - one that is "so full of history, like a good marriage" - and only a few details remain left to organise. Then a letter arrives informing Geoff that the body of Katya, his girlfriend of 50 years ago (before he met Kate), has been discovered perfectly preserved in the Swiss mountains. At first bemused, then unsettled, Kate starts to wonder just how well she knows her husband. I knew this film was going to be special right from its opening scenes. I couldn’t express why in words, it was more of a feeling. It felt to me as if all the stars had aligned - acting, directing, setting, score - and that I was about to enjoy an exceptional movie experience. And my instincts proved correct. For his film to work, director Andrew Haigh had to present a couple who looked and felt like they had been married for 45 years. And boy does he succeed. I felt the weight of the life they had behind them, both in their ups and downs. This life, their history, is everywhere - in their home, in their routines and in their interactions. Their marriage feels real. Actually, when Kate and Geoff are chatting in bed, I felt a little guilty - as if I was eavesdropping. It is, of course, the superb performances from Charlotte Rampling and Tom Courtenay that make Kate and Geoff’s marriage feel so natural - so poignantly ‘normal’. It really is an acting masterclass. The camera often lingers on Kate’s face. You see her reactions, however small and contained, as Geoff’s past starts to invade and destabilize her present. No words are necessary to understand her anguish. Geoff, meanwhile, often talks whilst off screen or with his face obscured. For me, this mirrored how Kate struggles to see him in the light of the letter. Geoff is also responsible for much of the humour in the film, which is welcome as the film ramps up the tension. In addition to these stunning performances, I also loved 45 Years for its attention to detail. Kate’s daily routine, with her morning dog walks and trips into town, just feels prefect. The home she shares with Geoff also feels right - I wanted to get a better look at their wonderful bookcase! The film’s score is wonderful - almost every sound in the film serves a purpose. The dripping taps, the squeaky piano stool and the soundtrack to making tea all serve to make the Kate and Geoff an authentic couple. Meanwhile, each song that is heard is crucial and speaks volumes. 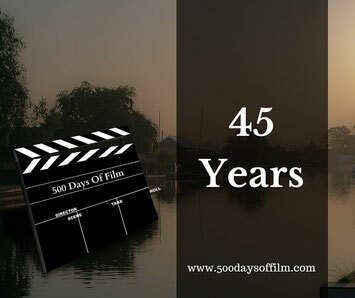 45 Years is a quiet film that observes its characters and needs no bangs and whistles to tell its devastating story. It is wonderful, unsettling and deeply moving. I really can’t recommend it enough. Andrew Haigh directed Weekend, which I also loved. He gets to the beating heart of relationships - both old and new. Have you seen 45 Years? It was released in the cinema at the same time as being available for online streaming. I watched it via Curzon At Home. You can also rent it from Google Play. If you have seen this film, what did you think of it? I’d love to know, do leave me a comment in the box below if you have the chance! This sounds fantastic and I can't wait to look it up. I've got a couple others I need to field first and I'm off to TIFF on Thursday, so I hope I'll be able to make time for it - and let you know what I thought! Great review. Thanks Jay! I really appreciate your comment. I hope that you enjoy 45 Years as much as I did. Do let me know! What are you watching next? Have a fantastic time at TIFF - looks like an amazing event. Just saw this and really enjoyed it also. It's amazing how the yearnings for the past can sometimes make such a mess of the present. Some of the subtleties of the movie were just so perfectly done. Thanks for the recommendation Jane!